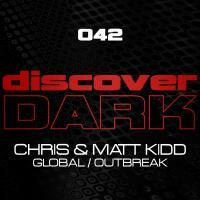 Chris and Matt Kidd return to Discover Dark with this quality two tracker after absolutely smashing it with their recent collaboration with Activa on Discover and their previous solo outing with Obsessive/Compulsive on Discover Dark. First up is "Global", a track which expertly fuses a hypnotic groove (largely fuelled by the baseline), a suitably understated tech trance topline and a funky vocal stab to superb effect. "Outbreak" looses the "trance" and sticks firmly to "tech" with a suitably edgy techno slab that moves and grooves driven by another monster bassline and their trademark tight as you like production. It all adds up to another quality Discover Dark release which is perfect for the dirtiest corners of the darkest disco's!!! 'Global / Outbreak ' is available now from Beatport and iTunes.